The statement of the UN Security Council identifying the impacts of climate change as a threat to international peace and security is most timely. Climate change has become not only one of the greatest challenges to international peace and security, but also the greatest emerging humanitarian and development challenge of our time. There is a growing realization internationally that climate change is becoming a security issue in many parts of the world. Putting an end to the debate over climate change, the UN Security Council in a presidential statement declared at its meeting on climate change on July 20, 2014 that possible adverse effects of climate change may, in the long run, aggravate certain existing threats to international peace and security. UN Secretary-General Ban Ki-moon declared that climate change was an “unholy brew” that could create dangerous security vacuums, and that we must address the clear danger that not only exacerbates the threats but was itself a threat to international peace and security. Climate change, in fact, acts as a threat multiplier for instability in some of the most volatile regions of the world. Projected climate change will seriously aggravate already marginal living standards in many Asian, African, and Middle Eastern nations, causing widespread political instability and conflict. The matter is thus not one of individually occurring, monocausal crises and conflicts, but rather one of a great number of destabilizing, mutually amplifying factors. Climate change induced security threats particularly emanating from water stress and natural calamities have a real crux for regional security dynamics notably for the South Asian region. The effects of increased climate change most particularly water scarcity, increased natural disasters, food insecurity, loss of livelihood, displacement and migration, loss of marine biodiversity and fisheries that will intensify existing conflicts and at the same time will draw new lines of conflicts in South Asia like many regions in the world. Effective climate change mitigation and adaption efforts, dialogue and sharing of knowledge and technology, and regional mechanisms can diminish climate induced consequences and thereby lessen the likelihood of conflicts in the region. Climate change induced threats and security implications cover a wide spectrum. A recent scientific assessment presents a worrisome picture. According to the Fourth Assessment Report of IPCC, eleven of the last twelve years (1995-2006) rank among the twelve warmest years since 1850. The 2007 IPCC report predicts temperature rise of 1.1 – 6.4 °C by 2100. The number of natural disasters in the world may double during the next 10 to 15 years. Over the past ten years, 3,852 disasters killed more than 780,000 people, affected more than two billion others and cost a minimum of $960 billion. Major vulnerabilities induced from climatic hazards include human displacement, drinking water shortage, reduced agricultural productivity and food insecurity, loss of livelihood, health hazards, energy crisis, and disaster security. In different regions with water scarcity, climate change is worsening water quality and availability. Currently, 1.1 billion people are without access to safe drinking water. 120 million to 1.2 billion will experience increased water stress by the 2020s in South and South East Asia. More than 3.5 million people die each year from water-related disease; 84% of them are children. Nearly all deaths (98%) are in the developing world. This crisis may in turn fuel existing internal or inter-state conflicts and social conflict and it is feared that unresolved water issues could trigger an Indo-Pakistan conflict, which would have unpredictable consequences internationally. One of the most worrying consequences of climate change is reduced agricultural productivity and the resultant food insecurity. If global warming rises to 3°C it is likely that the number of people suffering from hunger will increase by 250 million to 550 million. According to the German Advisory Council on Global Change, agricultural production from rain-fed agriculture could fall by about 50% in some regions by 2020. Rising food prices could potentially push hundreds of millions of people back into poverty. This situation can undermine the economic performance of weak and unstable states, thereby aggravating destabilization, the collapse of social systems and violent conflicts. A changing climate affects the essential ingredients of maintaining good health: clean air and water, sufficient food and adequate shelter. Every year, the health of 235 million people is likely to be seriously affected by gradual environmental degradation due to climate change. Climate change is projected to cause over 150,000 deaths annually and almost 45 million people are estimated to be malnourished because of it. Direct economic losses and human casualties of global disasters have increased in recent decades, with particularly large increases since the 1980s. According to Oxfam, developing countries will require at least $50bn annually to adapt to unavoidable climate change-related disasters. The impacts of climate change may damage key energy infrastructures, such as energy plants, energy routes, nuclear installations, and consequently destabilize public order. For instance, an earthquake in Japan caused an explosion in the Fukushima nuclear plant, causing human casualties and disruption to energy production. The decline in hydroelectric power generation may additionally reinforce competition and conflicts over fossil energy sources. Climate change could potentially trigger large-scale displacement and migration from one region to another. The 2001 World Disasters Report estimated that there were currently 25 million “environmental refugees.” It is estimated by the IPCC that by 2050, 150 million people could become climate refugees, being displaced by sea level rise (SLR), desertification, increasing water scarcity, floods and storms, etc. Climate change also has hard security dimensions. Climate-induced insecurities can trigger interstate tensions and conflicts. States may be stressed to the point of collapse. The potential for regional conflicts due to climate induced condition will be extremely high. Radicalization and terrorism may increase in many developing societies, particularly in South Asia, due to climate-induced social and economic deprivation. When a government can no longer deliver services to its people, conditions are ripe for extremists and terrorists to fill the vacuum. Resource scarcity could be a contributing factor to conflict and instability. The 1994 genocide in Rwanda was in many ways a consequence of squabbles over agricultural resources. The 1974 Nigerian coup resulted largely from an insufficient response to famine. The situation in Darfur, which had land resources at its root, is spilling over into neighboring Chad. The United Nations estimates 300 potential conflicts over water exist around the world today. South Asia is known to be the most climate-change affected and disaster-prone region in the world supporting a huge population of more than 1.58 billion. Water is the issue in the region that is affecting human security, such as safe drinking water, water related hazards and also aggravating potential military conflicts particularly between India and Pakistan. Major regional security implications induced by water stress include decreased water availability and water quality in many arid and semiarid regions, an increased risk of floods and droughts in many regions, reduction in water regulation in mountain habitats, increased incidence of waterborne diseases such as malaria, dengue, and cholera, decreased agricultural productivity, adverse impacts on fisheries, adverse effects on many ecological systems, decreased reliability of hydropower and biomass production, and importantly increased damage and deaths caused by water related extreme weather events. Climate change increases the variability of water supply in South Asia leading to floods during some parts of the year and droughts in others. Increasing water shortages relative to population growth are putting the Indus Basin irrigation and drainage system in danger of collapse. Water availability on per capita cubic meter basis in the Himalayan River Basins is likely to decline from 7320 to 5700 in case of Bangladesh in 2030, from 8500 to 5500 for Nepal, and from 1730 to 1240 in India. The report assessed implications of the likely decline of 275 Billion Cubic Meters (BCM) renewable fresh water in India, Nepal, Bangladesh and China by 2030 for food security, health, migration, bio-diversity, social stability and interstate relations in the region. The Himalayan range contains high altitude glaciers that supply water to many rivers in Asia. These rivers provide water to more than half of the world’s population. Many people in Asia are dependent on glacial melt water during dry season. Accelerated glacial melt questions the very perennial nature of many of the Himalayan flowing rivers. This is likely to have huge implications on those dependent on the resource affecting water availability for agricultural purposes. Glaciers in the Himalayas are receding faster than in any other parts of the world. In Northwest China, 27% of the glacier area will decline by 2050 (equivalent to an ice volume of 16,184 km3), as will 10 to 15% of the frozen soil area. IPCC forecast that if current trends continue, 80% of Himalayan glaciers will be gone in 30 years. The current trends of glacial melt suggest that the Ganges, Indus, Brahmaputra and other rivers across the northern Indian plain could likely become seasonal rivers in the near future. This poses a challenge for reducing the vulnerability of the more than 1.3 billion people living in the major river basins downstream from the Hindu Kush-Himalayan region. The rapid retreat of the Himalayan glaciers has consequences for water-related hazards, such as glacier lake outburst floods, and for water stress, as a result of the decline in fresh water supplies during the lean season. The conflict potential emanating from the melt-down of Himalayan glaciers underlies the factors leading to cross-border water-related conflicts, such as per capita water availability, the level of water withdrawals for annual use in relation to its availability, and the extent of dependence on water resources that flow in from the borders. In South Asia, reduced agricultural productivity due to decreasing water availability and water related natural catastrophes is one of most worrisome consequences of water stress. In the next 20 years, China, Nepal, India and Bangladesh in the Himalayan sub-region will face a depletion of almost 275 billion cubic meters (BCM) of annual renewable water. 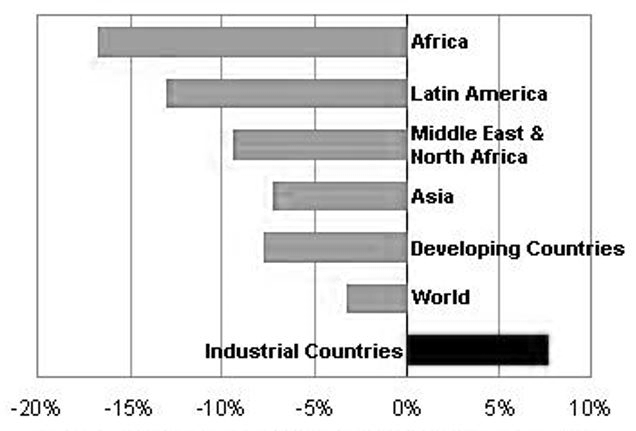 The agricultural sector will continue to be the major consumer of water in these countries although the industrial and domestic sectors will also need more water in the future. The crop yield will drop by 30-50% in the case of all the four countries by the middle of the century. Agriculture accounts for almost 90% of the water usage in India, but this will decline to 70-75% by 2050. Nepal and Bangladesh presently use more than 95% of their water for agriculture and will continue to do so until 2030. According to the Ministry of Agriculture and Cooperatives, Nepal will have a food deficit owing to unfavorable monsoons. With changing weather patterns, erratic monsoons and rising temperatures, the “too much water, too little water” syndrome is likely to continue in Nepal. Reports from the China Daily indicate that the 1995 grain harvest in Shandong province declined by 2.7 million tons (food for 9 million people) due to water failures of the Yellow River. Political and community boundaries are something that water flow ignores at large as decisions in one place affect water use elsewhere. In the case of shared river basins, water use upstream can affect downstream quality and quantity, thus creating the potential for conflicts of interest. Water-related issues led to interstate tensions and significantly hampered development, such as along the Nile, Euphrates, Indus and Ganges rivers. In South Asia, the potential for hydro-conflict is more severe than in many parts of the world particularly Africa. India is hurtling water by building expensive hydroelectric dams in remote valleys of Indian-controlled Kashmir. India plans, being a rapidly growing but power-starved economy, to build many more dams over the next decade. There are concerns over the Indus Waters Treaty that was concluded in 1960 that sets out the legal framework for the sharing of the waters of six rivers—Indus, Chenab, Jhelum, Sutlej, Beas, and Ravi—that flow through northern India into Pakistan. But the concern is growing in Pakistan that India is controlling the water flow of the Indus, Chenab and Jhelum that pass through India’s Jammu & Kashmir state. Since the Indus provides water to over 80 percent of Pakistan’s 54 million acres of irrigated land, dam and water withdrawal by India will cause desertification and have devastating impact on Pakistan’s agricultural productivity leading to wide-scale food insecurity in that country. Water withdrawal and dam construction by India is a potential source of bilateral tension and conflict. Pakistan fears that India can make the country solely dependent on India in terms of water and can create drought or famine during crucial times like a war. The level of securitization went to the stage of nuclear redline with the warning from Pakistan. Afghanistan plans to build 12 dams on the Kabul River with a combined storage capacity of 4.7 million acre-feet, which Pakistan frets will further diminish the Indus water supply. Bangladesh and India have also unresolved disputes over water sharing of common rivers. Bangladesh shares 54 rivers with India, but it has agreement for only one river. From 1974, India started unilateral diversions of water from Ganges River after the construction of Farakka Barrage. The Ganges Water Treaty, which was concluded for 30 years in 1996, is not also implemented rightly because of Indian unilateral withdrawal. India is violating the clauses of the Treaty by supply more during the season that causes flood and less supply in the dry season resulting in droughts. Major impacts of this withdrawal include saltwater intrusion, vegetation damage, erosion, reduced conveyance capacity, and disrupted fishing. In addition, the construction of Tipai Mukh Dam, disagreement over water sharing agreement for the Teesta River and India’s plan to start a countrywide river linking project will significantly increase tension between the two countries that can be extended to the state of military conflict in the near future. Bangladesh is predicted to be one of the worst victims of climate induced insecurities. The IPCC statistics show that rising sea levels will wipe out more cultivable land in Bangladesh than anywhere in the world. By 2050, rice production is expected to drop 10 percent and wheat production by 30 percent. About 20 to 30 million people in Bangladesh could be on the move by 2050 because of climate change, causing the worst migration in human history. Flood is the most frequent and most intense natural disaster in Bangladesh. Every year flooding due to heavy rain cause thousands of people to suffer from loss of shelter, property and also agricultural products. The high projected rise in sea level of about 88 cm (35 inches) would flood agricultural lowlands and deltas in parts of Bangladesh. Sea level rise will increase flood frequency and flood duration, affecting Aman production. A flood, which ravaged the southwestern part of Bangladesh in 2000, caused damage or losses of at least $500 million to crops, fish farms, property and infrastructure. The shrimp sector was the most affected, losing shrimp fields equivalent to $230 million. Major impacts of sea level rise on water resources in Bangladesh are fresh water availability reduction by salinity intrusion. Both water and soil salinity along the coast will increase with the rise in sea level, destroying the normal characteristics of coastal soil and water. A water salinity map for the period of 1967 and 1997 produced by the Soil Resources Development Institute shows that the problem is already on its way. Soil of Jessore, Magura, Narail, Faridpur, Gopalgonj and Jhalokati was newly salinized in 24 years of time expansion. A one meter sea level rise will expand the soil and water salinity area at a faster rate. For example, loss of rice production in a coastal village of Satkhira district in 2003 was 1,151 metric tons less than in 1985, corresponding to a loss of 69 percent. The spread of water borne diseases in the coastal areas of Bangladesh is another worrisome consequence of climate induced natural disasters. Almost one in five people in Bangladesh still lack improved water resources making them susceptible to water borne diseases like anemia, arsenicosis, cholera, diarrhea, hepatitis, malaria, schistosomes, typhoid and so on. With the increased density and distribution of salinity, cholera germs are getting favorable habitat and spreading in the coastal areas. Most major epidemics that have occurred during the last 50 years originated in the coastal region. Besides, arsenic contamination in the ground water of Bangladesh is another crucial concern for the country. The World Health Organization described the arsenic contamination in Bangladesh as “the largest mass poisoning of a population in history”. Half of Bangladeshis, up to 77 million people, have been exposed to the toxin. 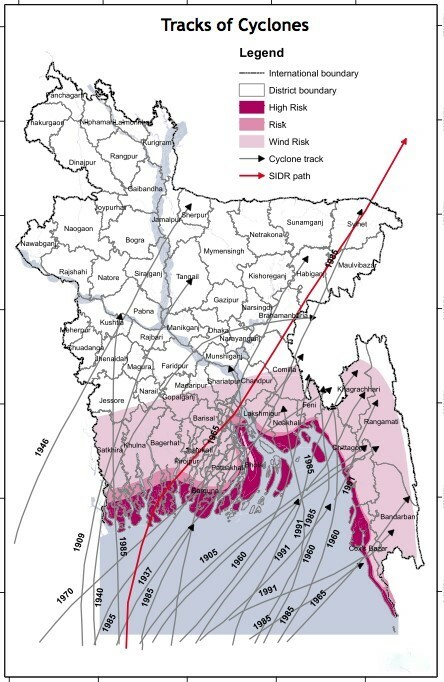 Water related natural disasters can create the most striking vulnerability for Bangladesh. Every year natural calamities upset people’s lives in some part of the country. The major disasters concerned here are the occurrences of flood, cyclone and storm surge, flash flood, drought and riverbank erosion. Although this country with a monsoon climate has enough rain, droughts frequently take a significant portion out of the agricultural economy of Bangladesh, and cause hunger, instability, and insecurity. For instance, between 1991 and 2000, 93 major disasters were recorded in Bangladesh, resulting in nearly 200,000 deaths and causing $5.9 billion in damages with high losses in agriculture and infrastructure. South Asia is extremely vulnerable to natural disasters, with more than 900 events reported since 1970. Between 1990 and 2008, more than 750 million people—50 percent of the population in the region—were affected by at least one natural disaster, causing almost 230,000 deaths and about $45 billion in damage. Since 1970, the number of reported natural disasters in the region has been rising steadily. The major impacts of natural disasters in South Asia include: human casualties and damage to properties from extreme weather events; loss of shelter, large-scale displacement and outbound migration; water-logging and human sufferings from large-scale flooding; loss of agricultural production due to flood and drought; adverse impacts on fisheries; increased incidence of diseases such as malaria, dengue, and cholera; pressure on scarce resources, resource competition, social instability and violent conflicts; trans-boundary migration and interstate tension and conflicts; damage to critical infrastructure such as nuclear plants, energy pipelines, etc. The areas and populations that face the highest risk from natural disasters are located in Bangladesh and Nepal. According to the 2011 World Risk Report, countries like Bangladesh, India, Nepal and Pakistan exhibit a high level of vulnerability as demonstrated by their lack of coping capacities and adaptive capacities. In September 2011, a 6.9-magnitude earthquake in Nepal’s Kathmandu Valley displaced 12,301 people and killed six people. There are growing fears that the country’s capital, Kathmandu, home to two million inhabitants, is due to experience a devastating earthquake – like the 8.0-magnitude quake that occurred 77 years ago and killed more than 225,000 people – and it is not prepared. Flood is the most frequent and most intense natural disaster in South Asia. For instance, the 2010 Pakistan floods resulted from heavy monsoon rains in the Khyber Pakhtunkhwa, Sindh, Punjab and Baluchistan regions and affected the Indus River basin. Approximately one-fifth of Pakistan’s total land area was under water, i.e. approximately 796,095 square kilometers (307,374 sq mi). According to Pakistani government data the floods directly affected about 20 million people, mostly by destruction of property, livelihood and infrastructure, with a death toll of close to 2,000. In Bangladesh every year flooding due to heavy rain causes thousands of people to suffer loss of shelter, property and also agricultural products. Sea level rise will increase flood frequency and flooding duration, affecting Aman production. Bangladesh is most vulnerable to several natural disasters and every year extreme natural events adversely affect the entire environment, including human beings, their shelters and the resources essential for their livelihoods. Cyclones and storm surges occur frequently and cause significant destruction in the coastal areas of the country. Tropical cyclones and tornadoes leave serious adverse effects on the economy as well as on the whole environment. Although this country has enough rain, droughts frequently take a significant portion out of the agricultural economy, and cause hunger, instability, and insecurity. Climate change induced migration is going to be an acute condition in South Asia. Major disasters—flood, earthquake or cyclone—may induce massive transboundary migration. One of the riskiest places to live is in the low-elevation coastal zones. Worldwide, the largest populations living on low-lying coasts are in the Asia-Pacific region in countries like China, India, Bangladesh, Vietnam, Indonesia and the Philippines. It is estimated that by 2050, 150 million people could be displaced by climate change related phenomena like desertification, increasing water scarcity, floods and storm, etc. Besides, large-scale migration will add extra pressure on the scare resources in the society and thereby heighten competition and conflict over resources. Intra-regional forced migration, such as those from Bangladesh to India could possibly stimulate bilateral tensions. In order to reduce the regional security ramifications, South Asia is strongly in need of collective endeavors and efforts. Regional cooperation is bound by certain common grounds. Most of the victim countries in South Asia are interlocked by common geography and geology, having many climate induced vulnerabilities. Natural disasters do not respect national boundaries. For instance, all major floods have their origin and consequences beyond a single country and also earthquakes in the Himalayas are likely to affect more than one country. Therefore the countries in the region have a collective interest in water sharing, disaster management and cooperation. Climate change induced implications are looking more and more unpredictable causing more frequent and intense natural disasters and creating new lines of vulnerabilities and conflicts in the developing countries of the region. At this juncture, it is crucially important to recognize that climate change is pervasive and has more security implications than any other threat today. Climate-induced challenges should be placed at the core of security considerations in a rapidly changing world. Hence, effective international cooperation, as advanced by the UN Security Council, should be formed to address the unpredictable security consequences of climate change. Mitigation and adaptation responses must go hand in hand. Just because we are adapting does not mean we can stop mitigation efforts. But in some areas of the world, for example in Bangladesh, we are beyond mitigation because the negative impacts of climate change are already being felt and will become more severe in the coming years. We must start building up our capacity to respond immediately. The symptoms of climate change are already very clear; so we must prepare for the worst now. Besides, governments should initiate capacity building of the states, military and the coastal communities along with adopting national and regional policy framework, building public awareness, sharing and exchanging knowledge, information, technology and expertise. Strengthening and enacting of legal regimes, and increasing the role of international organizations should be prioritized. Above all, political will and cooperation among the political actors must be in the frontline to fight against climate-change driven social and political ramifications in the foreseeable future.